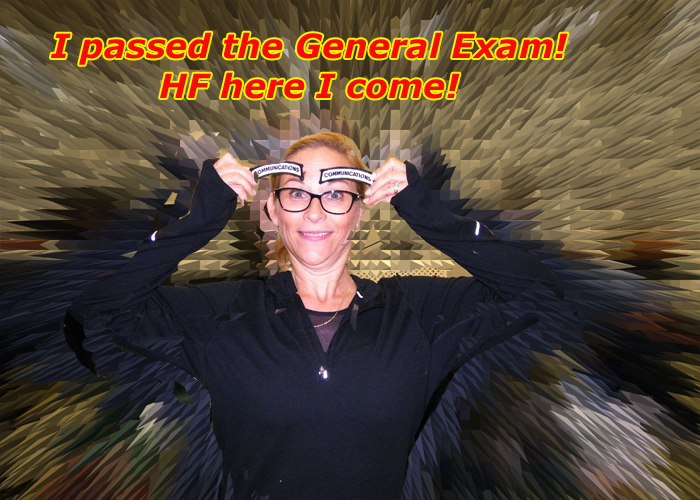 Michelle passed her General with flying colors, and now has that Extra License in her sights. You ain't never gona believe this! Would you believe alternating sheets of an old QST magazines with aluminum foil, and then saturating the combination with fresh coffee generates enough power to run a QRP radio in an emergency? On any other day, other than than April 1st, you might want to take this seriously. Below, Andrew and Mike are supposedly demonstrating this. All in good fun, and a continuation of LARC tradition on every April Fools Day. DMR - what is it and how is it different? 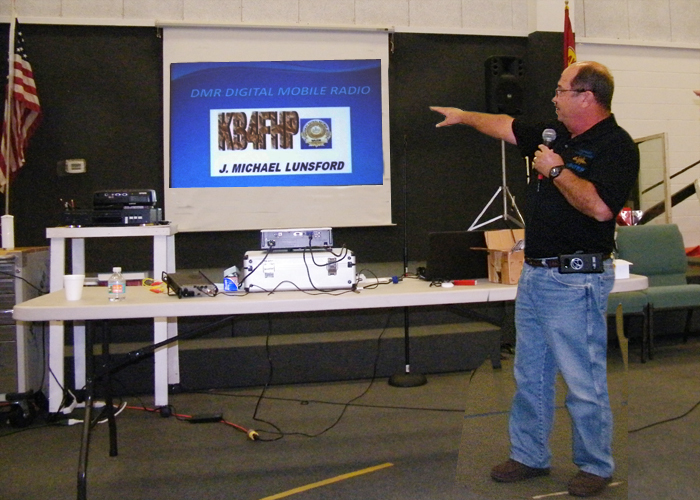 Our speaker this evening was Mike Lunsford, KB4FHP. 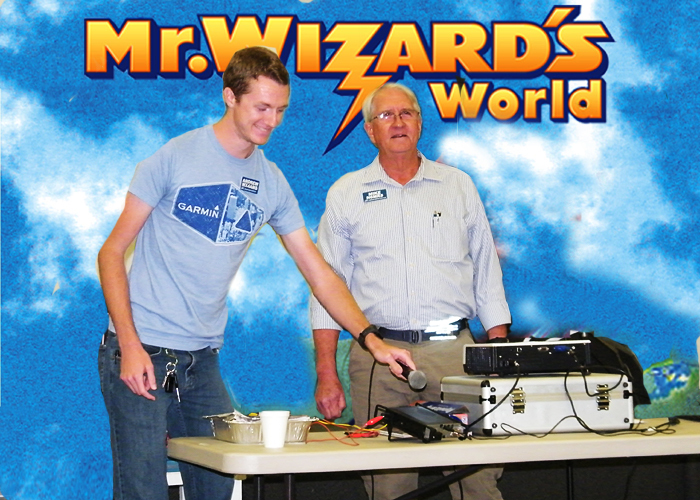 Mike presented the case for DMR, yet another flavor of digital radio. LARC members are familiar with Fusion, Yaesu's proprietary digital mode. Then there is D-Star from icom, also proprietary. DMR on the other hand is an open and published digital standard. This means that those with the knowledge and inclination can lift the hood so to speak and experiment. New flavors of communication often result. This is what ham radio is all about. In the very near future the LARC repeater will have the capability to do AllStar and EchoLink. Two more modes of communication. EchoLink is proprietary, while AllStar, like DMR, is open source. It is fair to ask why so many different ways do the same thing? The same question can be asked about programming languages. Why so many? The answer is that some are better suited for some jobs than others. They are tools. The same is true of radio communications in general, and digital modes in particular. Mike made his point during the meeting by passing out multi-colored lollipops. While each had a unique flavor, grape, orange, lime, and cherry, they were all the same in the sense that each had a tootsie roll center.They were all different, but when you get down to it, very much alike at their core. Click here to get a copy of Mike's presentation. If you are new to ham radio you may wonder what fox hunting is all about. In ham speak the fox is a small radio transmitter that is hidden somewhere near by. Using all their radio direction finding skills, the hunters try to discover the location of the hidden transmitter, or fox. This is not as easy as it sounds, especially when you get close to the transmitter. The key to successful foxhunting is the antenna. Two of the many kinds of antennas used for foxhunting were shown. 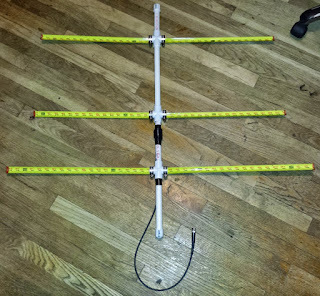 Instructions for building a tape measure yagi can be found on the web. Here is a site that does a pretty good job explaining how to build one, but keep in mind there are others as well. 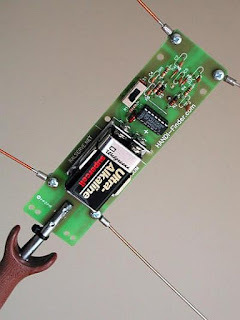 If you are interested in foxhunting and want to try your hand with your own super special antenna creation, let me know. I will be happy to bring the fox to the next picnic so you can test your foxhunting skills. If nothing else, you will work up a good appetite running around the park. As in most cases, Google is your friend when it comes to research. 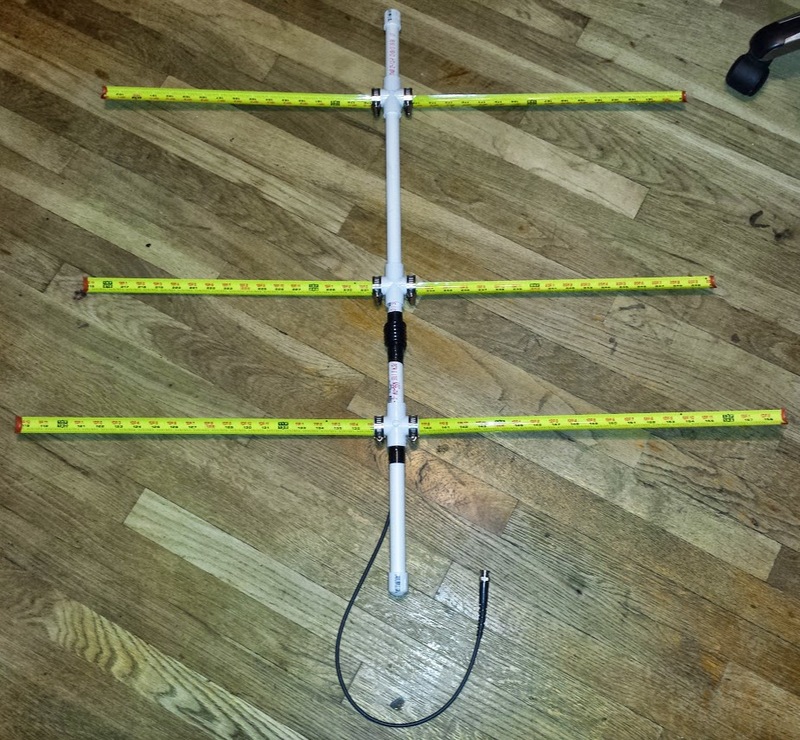 Google foxhunting amateur radio to get started. Good hunting! We had a remarkable turnout this evening. We had a remarkable turnout this evening. By our Top Sargent's at arm's count, well over seventy.